Quite often I find myself in or near Somerset House in the centre of London – partly because work sometimes takes me to the Strand, partly because I’m a regular visitor to the Courtauld Gallery, both for its stellar permanent collection and for its often excellent temporary exhibitions. You get into the gallery through a door inside the vast building’s entrance archway, but I often take a minute to walk around the vast courtyard while I’m there, marvelling at the building’s size, proportions, and plethora of architectural sculpture. It’s easy to take for granted Somerset House’s 18th-century classicism and vast size now, but back in the 18th century this was an innovative building: London’s first office block and a formidable feat of organisation in bringing together several diverse bodies of scholarship and government – the Royal Academy, the Navy Board, the Stamp Office, for example, and accommodating them within what looks like a classical palace. This year, however, the Courtauld Gallery (which occupies just a small part of the complex) is closed for redevelopment* and I’ve not been in the Strand entrance – my most recent encounter with Somerset House happened to be at the back, when I was walking along the Thames embankment. As you move along the pavement on this river side, it’s hard to take in the facade because it’s enormous – some 800 feet long. It’s also part of a major engineering project. The architect, William Chambers, had to cope with the fact that there is a 40-foot drop between the Strand frontage and the river shore. So he had to construct the embankment to allow for this and support the southern part of the building. From the pavement, you see a succession of massive stone walls, much of the masonry heavily rusticated, some of it vermiculated, and punctuated with arches, niches, and occasional pieces of carving on keystones. What struck me as I took all this in was not just the sheer scale, but also the meticulous craftsmanship. A close-up of an arch and a neighbouring bit of wall, above, might demonstrate what I mean. For a start, the sheer effort in cutting by hand all that vermiculation on the stone blocks. 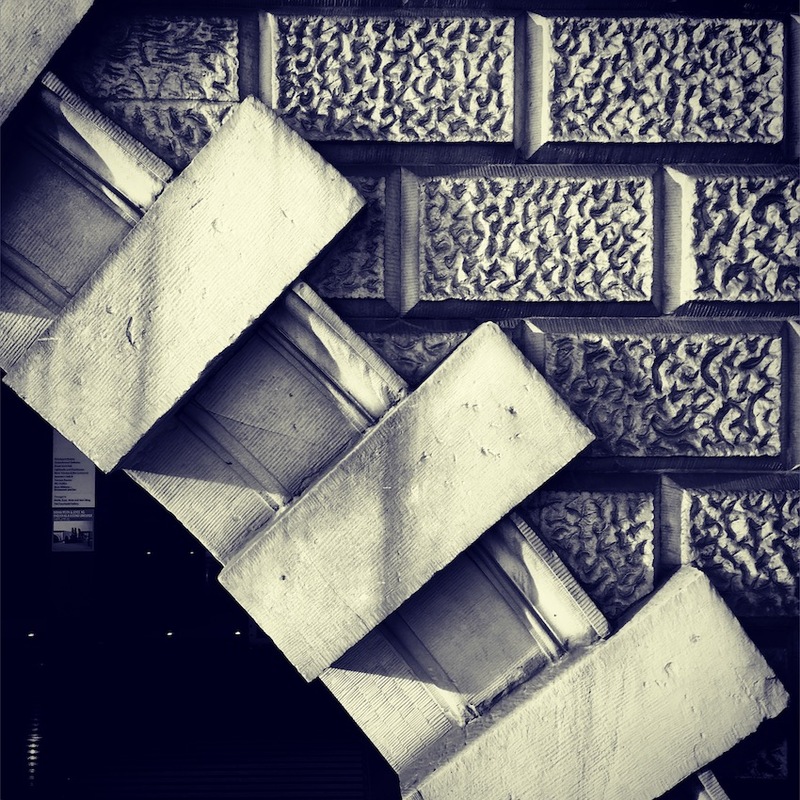 Admirers of the brutalist architecture of London’s Barbican Centre sing the praises of the concrete, in which many of the surfaces have been bush-hammered to give it a textured finish. True enough, this takes care and skill, and the effect is admirable. But look at this detail of Somerset House – square yard upon square yard of hand-cut vermiculation: it represents skill and effort in abundance. So does the moulding of the arch and the precise cutting of its blocks. But look still more closely (clicking on the image should help) and one can see that the surfaces of these apparently flat pieces of stone have been expertly and finely tooled so that their surfaces are actually made up of a series of precise parallel lines, the work of who knows how many skilled man-hours. A similar affect is even visible on the bevelled edges of the vermiculated blocks. * A small selection of master works from the permanent collection is currently on display in the National Gallery and remains there until April 2020; some are also on loan to the Fondation Louis Vuitton, Paris. Reopening is not expected until some time in 2020. ¶ The photograph is slightly high resolution than usual, because I hope that will help readers to see the surface of the flat stones clearly. I have also increased the contrast a bit, to bring out this effect. Clicking on the image, as usual, will enlarge it. I spent much of Monday evening staring at the television screen, in silence like most of the watchers in Paris, as the cathedral of Notre-Dame burned. I kept thinking of an essay by the American writer Guy Davenport* in which he describes the sculptor Henri Gaudier-Brzeska, who was descended from the carvers who worked at Chartres. During World War I, Gaudier watched in northern France as a cathedral caught fire, and he saw ‘great globs of lead’ falling from the cathedral roof on to the floor below. For Davenport, watching a cathedral burn was a symbol for the disintegration of civilisation that occurred during World War I: nothing afterwards was ever quite the same. This notion got somewhere near suggesting how important medieval cathedrals are in European culture, and the Gothic cathedrals of France especially. It was in France – at St Denis, north of Paris – that Gothic began, and the style spread, thanks to the advocacy of churchmen and stone masons, across the continent, as the ideas of western Christendom spread. Gothic was revived in the 18th and 19th centuries, and for many architects was the essence of architecture, and of church architecture especially. Of all French architects, perhaps the greatest 19th-century advocate of Gothic was the magnificently named Eugène Emmanuel Viollet-le-Duc, who restored Notre Dame and built the slender central spire that was destroyed this week. Viollet’s work was a reminder that the medieval cathedrals have been subject to repair and restoration almost as long as they have existed. Monday’s fire was terrible, but it was one in a catalogue of mishaps and disasters from which these buildings have often recovered. In Britain we think of the fire at York, the damage caused to Coventry in the blitz, the destruction of old St Paul’s in London’s ‘Great Fire’, itself one of a succession of city fires. York represented a recovery; Coventry the survival of a ruin and a spire; St Paul’s destruction, but a destruction that brought into being Wren’s magnificent 17th-century cathedral, a resurrection of a different kind, as Wren himself proclaimed. 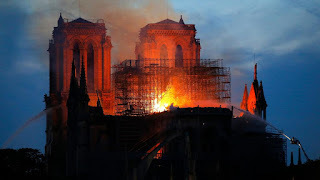 The medieval cathedrals often survive, because their structures are built mainly of stone, which can certainly be damaged by fire and be badly affected by smoke and fire-fighters’ water, but which is more resilient than flammable wood and lead, the materials used in their roofs. So as I watched the television I kept hoping that, once the wooden parts had been consumed, once the ‘globs’ of lead had fallen, the stonework would not be too badly affected and that perhaps even the stained glass might escape at least in part. Then we would not need quite yet to contemplate the vision in a poem by Gérard de Nerval, in which he foresees a moment, in some future millennium, when time has laid waste to Notre-Dame and all we have to contemplate is a magnificent ruin, through which we can imagine the old cathedral, ‘like the shade of one dead’.† My hopes may have been justified. It’s far too soon to know how much damage there has been to the stonework. But a lot of the stone vault is still there – surveyors will be watching it like hawks in the coming days and weeks. The twin west towers still stand, and the stone skeleton of walls, columns, and buttresses seems largely complete. There’s even glass in some of the windows. It’s enough to give one hope. Another thought I had was that restoring the building would have to be a vast project of collaboration. The French would of course be the prime movers in this, and they don’t lack expertise, experience, or skill. But if people from other countries could take a hand too then something might be gained among the losses. So I was heartened to hear what President Macron had to say about restoring the cathedral (though I questioned his five-year target for the project§), and pleased to see that offers are already coming in from a range of places – with estates in England setting aside oak trees, with offers of expert help coming from the Czech Republic, to mention only two examples from countries with which I’m connected. Such a coming together, reflecting the coming together of international talent that produced the medieval cathedrals in the first place, would be heartening and valuable. If all this comes good, we won’t be looking at Nerval’s ‘shade of one dead’ for too long. We’ll be acknowledging that a building 850 years old has to be conserved, and has to be occasionally renewed. Instead of a shade, we’ll be marvelling at one of the very greatest medieval buildings, arguably the best of the Gothic cathedrals and one of the first, the one Ruskin dubbed the noblest of them all.¶ And, disaster that the fire has been, we’ll not be experiencing the worst consequence of seeing a cathedral burn. * The essay is in The Geography of the Imagination (Picador, London, 1984). The cathedral would have been Reims, as suggested by an anonymous commenter to this blog and as I have now confirmed by checking in H. S. Ede’s book Savage Messiah, his account of Gaudier’s work and short life. † Notre-Dame is one of those buildings with a literature of its own. There is, most famously, the book by Victor Hugo that we Anglophones call The Hunchback of Notre-Dame (simply Notre Dame de Paris in French), which Nerval refers to as ‘le livre de Victor’ – we know which book he means. There are bits of Henry James (a wonderful response from Strether in The Ambassadors); there’s Nerval’s poem, another by Théophile Gautier, another by D G Rossetti, to name but some. There’s a selection in the magazine Apollo, illustrated with paintings and prints, here. I use Geoffrey Wagner’s 1958 translations of Nerval, in an edition that also includes the original French text. § Big restoration projects take years; conservationists can debate for months about a handful of decisions; everyone will brawl about new designs for the spire, maybe for years. But a spirit of collaboration could still work. We’ll see. 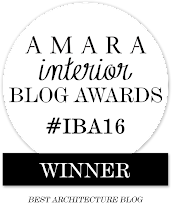 ¶ In The Seven Lamps of Architecture, 1855, he said that the building’s Gothic architecture was the noblest of all. 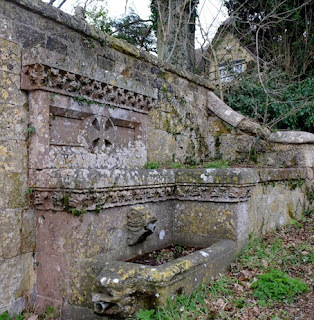 This drinking fountain is on the roadside at Enstone – actually in Church Enstone, which stands slightly apart from what I take to be the ‘main’ village, although, as is clear from the name, it’s where the parish church is. The fountain was designed by G. E. Street, with carvings by Thomas Earp,* and was built as a memorial to Eliza Marshall, who died in 1856. 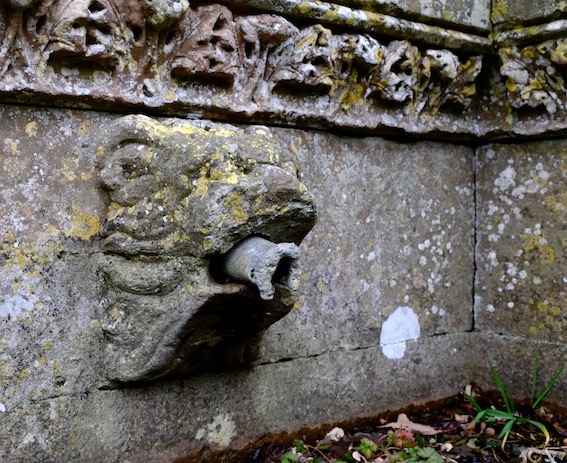 When I first saw it, my eye caught by the band of acanthus carving, I thought of it as ‘a horse trough’, but it’s actually three troughs, at different levels, with lion-mask spouts taking the water from one to the next. So far, so ingenious, I thought – a clever bit of design, taking advantage of the slope in the ground, and providing a no doubt once well-used facility for passing traffic as it made its way through the village. Spectacular waterworks were, as they say, a thing in the 17th century. 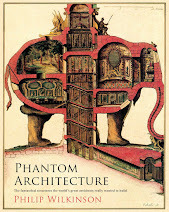 For example, Salomon de Caus, a French Huguenot engineer, published a book in 1615 called Les Raisons des forces mouvantes, which illustrated an early form of steam pump as well as various elaborate waterworks, fountains, grottoes, and the like. He and his brother, architect Isaac de Caus, worked in England and Isaac was an associate of Inigo Jones. The fact that such experts in the field spent time in England, and that the king was interested, goes some way to demonstrate the fashion for such works, mostly now long vanished. As for the Enstone Marvels, we know about them from Robert Plot’s Natural History of Oxfordshire (1677). This much I knew, but the further possible link between the Marvels and this Enstone drinking fountain is drawn by the author of the website Polyolbion, who has images of both the cottage and the lions on the drinking fountain.† These beasts indeed have a baroque look about them and might just possibly be a bit of inspired, historically important, bit of recycling. § The cottage is visible from the road, but not easily photographable without the kind of intrusion I was not prepared to make. † The relevant page from the Polyolbion site is here. A long time ago I absorbed the idea that photographs with a lot of shadow were a bad thing. The idea was, I suppose, that the shadow obscured the subject and there wasn’t much point in a photograph in which half of the frame was a vaguely legible black hole. There’s something in that, but it’s not the whole story. For one thing, shadows exist. A photograph with a lot of shadow can be an accurate reproduction of reality, and there’s something honest about that. 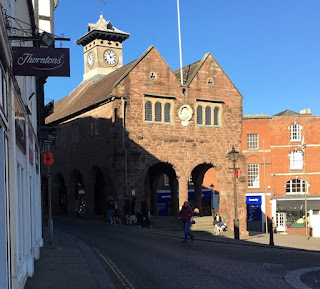 I was reminded of this fact when looking through my images the other day and coming across this one of the Market House in Ross-on-Wye, built in around 1650 at the top of the hill occupied by the town’s centre. You can imagine me walking along the street, struck (yet again) by the beauty of the pink-tinged Herefordshire sandstone and the way in which the sun’s rays illuminate and warm the side wall of the Market House. As I paused to look, I became aware too how the light and shadow threw the stonework into relief so that I could really appreciate its appearance: the worn stones of the arches and the pier holding them; the coursed but rather rough blocks of the middle parts of the wall; the smoother ashlar blocks further up – clearly the gables and roof were renewed at some point. Then you can imagine me leaning against the shop to my left and waiting for a gap in the traffic and for a moment when most of the passing shoppers were enveloped in shadow. Later there world be time to admire the clock tower, which Pevsner says is probably early-18th century. Maybe that is when the roof was altered too. Or was the change made as early as 1671, when the building was said to have been ‘newly erected’. 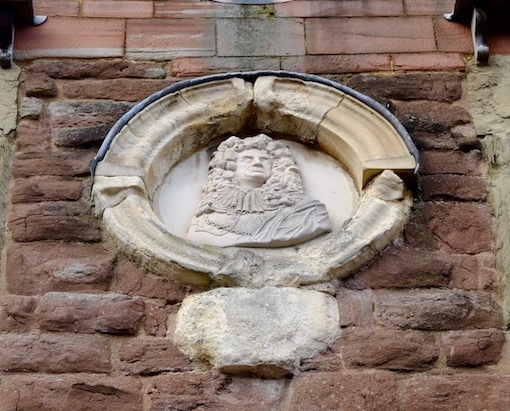 Relevant to this period is the stone roundel, between the two windows, which has a portrait of Charles II on it. This sculpture was recut in 1959, but presumably goes back to the king’s reign (1660–1685). It’s a drawback of my contrasty picture that you can’t see the details in this carved roundel, but I went back later and took another one, as a reminder that you can see things in more than one way. Several times since, I’ve had the chance to admire this piece of work in its new setting, at ground level, where it can be studied in much more detail and where it is protected by a transparent covering. It’s great to be able to see these ladies from close quarters. I’d been vague about the material when writing about them in their original location, high above the pavement, referring just to their ‘metallic’ surface. For ‘metallic’ read ‘metallic-looking’. They actually are carved out of stone, but stone has been painted to resemble silvery steel or aluminium. At eye level their surface still looks shiny, but also grainier. The details of the carving also look rather coarser – after all, the sculpture was never intended for them to see seen from so close. It’s still good that it were preserved, though. 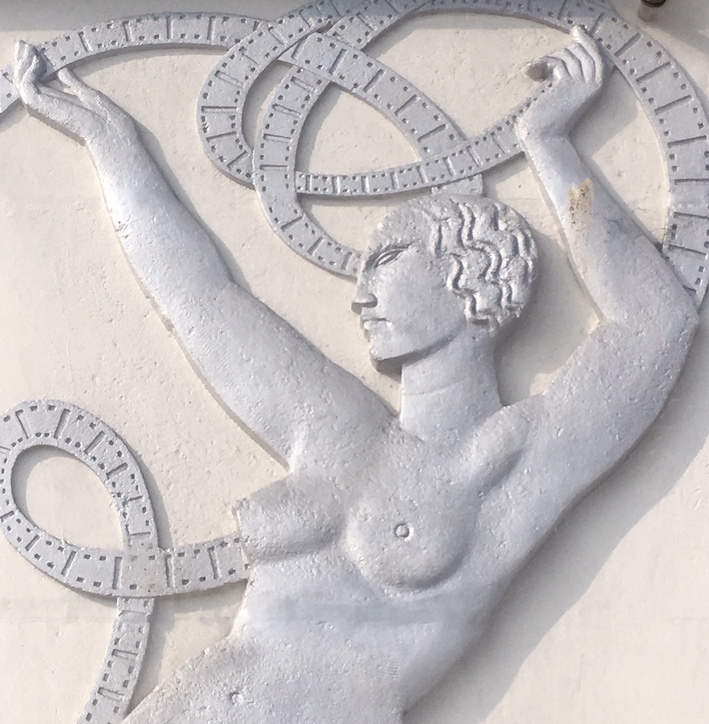 It’s a bit of Cheltenham history and part of the career of a notable sculptor whose work, so often attached to buildings (and cinemas above all), is frequently vulnerable to the demolition ball or the contractor’s hammer. 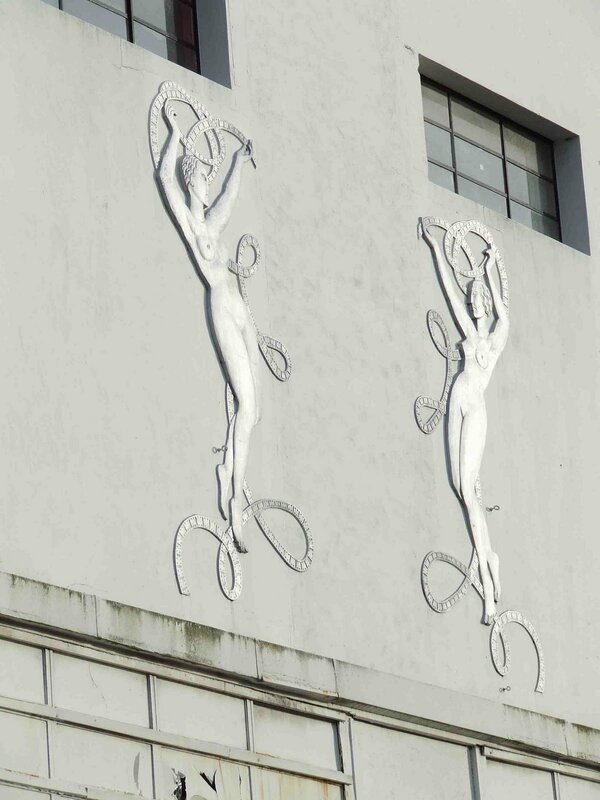 With their exaggerated figures, sleek hair-dos, and filmic context, the women are very Art Deco and very evocative. Let’s raise a glass (filled with a cocktail of our choice, of course) to their creator. 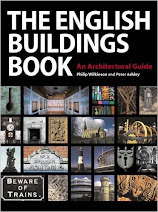 My obsession with the unregarded aspects of English architecture often brings me up against a small detail on a very famous building, a detail that seems to be unnoticed by most people. I’ve posted before about the unique telephone box in the entrance way to Burlington House, the grand home of London’s Royal Academy in Piccadilly. 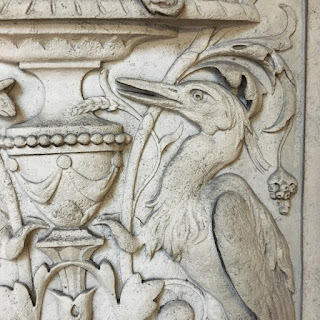 When I enter the building’s courtyard I also often pause at a place close by, to admire a set of relief carvings that encrust the stonework of the entrance arches. No one is ever looking at these when I go through – there is, after all, usually something else inside in the form of a major loan exhibition that’s waiting for their attention. But I think the carvings are worth more than a glance, even if the combination of animal and plant life with urns and ornament, plus cameo-like heads (not to mention classical draped figures in the spandrels of the arches), is hardly fashionable. * The work is certainly interesting if one bothers to look – if the urn in all its swagged and pelleted elegance is out of a pattern book, that bird with its opening beak, carefully delineated feathers, and inquisitive eye is a charmer. And the beast in the lower photograph is arrested and engaged me as I looked and tried to work out the relationship between head and massive paw and wings. I’m not sure who made these carvings – someone out there must know.† For the rest of us, they’re a diverting free show for the eye, a prelude perhaps to the serious art inside, or an interlude on the way up Piccadilly. 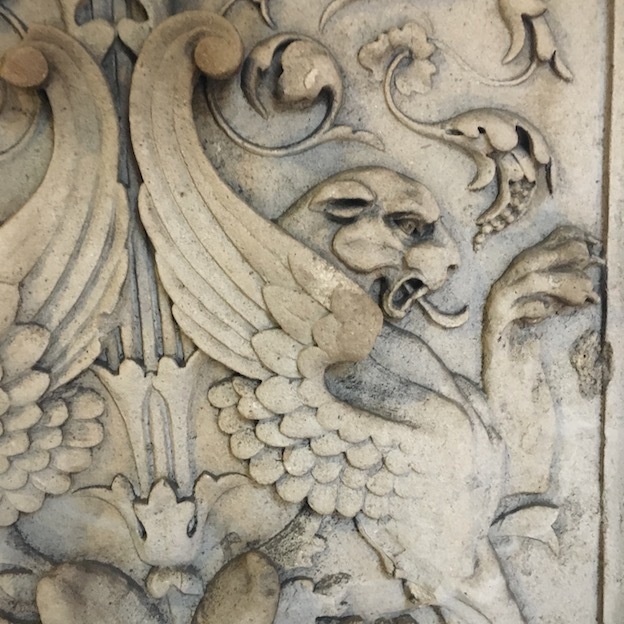 † Pictures of Burlington House’s architectural sculpture appear quite often on line, on photo-sharing sites, but I’ve not seen anywhere the name of the person who did these carvings. There’s an excellent post about the more prominent statues of artists on the same building at the Ornamental Passions site, here. In 1940 long defensive lines were constructed running across southern England to hold up an enemy advance in the event of an invasion. These lines, made of barbed wire defences, tank traps, and thick-walled concrete pillboxes, were extensive, but they had weak points where access routes crossed them. 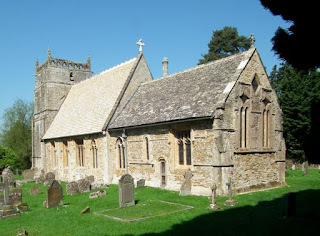 One such point was at Ilminster in Somerset, where, in those days, the A303 passed through the middle of the town. Ilminster itself was therefore fortified, with a ring of barbed wire and tank traps, some earthworks, 17 pillboxes (each with a machine gun), and a heavy gun emplacement. As well as the machine gunners, there would be riflemen dug in, and altogether about 400 people (up to half of them local home guard members) were needed to man this complex, defend Ilminster, and, so it was hoped, play their part in repelling the invading force. * Parts of this defensive line still exist. 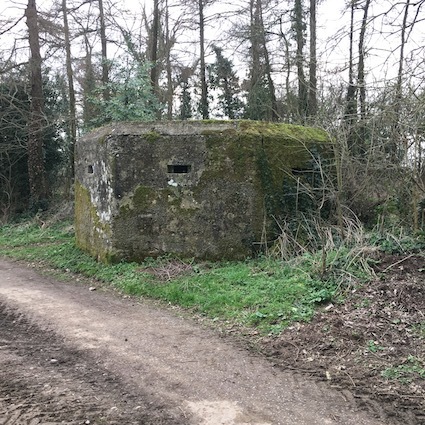 This pillbox is on a public footpath that once formed part of one of the long entrance drives to Dillington House, connecting the mansion to the town. The thick concrete has survived well, and the polygonal structure still looks fit for purpose. Eighty years’ growth of moss, plus some ivy, only help to camouflage the box. When I was a boy in the 1950s and 1960s, local pillboxes in Gloucestershire were somewhere to play. We all knew they had been built ‘for the war’, but the reality, that, if we’d been boys 20 years earlier and things had gone differently, our own fathers, or, more likely, grandfathers, might have been risking their lives defending them, hardly impinged.† Seeing such boxes now (and experiencing briefly the temptation to ‘play’ with them in another way, imagining not the brutality of war but the origins of brutalist architecture) brings one up short, as I’ve been brought up short by reconstructions of the First World War trenches in Piccardy or by exploring the formidable defences put up in Czechoslovakia, to no avail, in the late 1930s in the hope of protecting the country from invasion by the Nazis. I hope I’ll never have to confront this brutality in person, and that neither my son nor my nieces will either. All politicians should look at such buildings, use their sometimes limited imaginations, and reflect. * Information panels on site tell the story of these defences. I’m indebted to them. † Back then, c. 1960, memories of World War II were close for adults; everyone knew what you meant when you said ‘the war’.